The primary residence is laid out over four floors, with potential for five bedrooms, retaining much of it's character and with spacious rooms offering versatile accommodation that could be adapted to suit a variety of requirements. Situated centrally within its plot, the property features gardens to all sides which are currently, largely laid to lawn. There is a generous barn to the South West of the property which shows great potential for development (subject to consents) and to the North of the plot, an derelict building formally used as a reading room during the war - again with great potential for development. A long driveway forms part of the residence (not included in the 3 acre total estimation), which provides access to approximately 1.5 acres of land as well as neighbouring property. 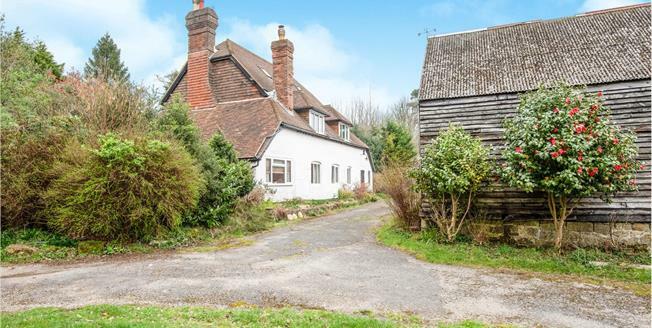 Situated in the sought after village of Broad Oak just outside Heathfield. Ideally located for commuting to Tunbridge Wells and Eastbourne, Broad Oak offers local shops, including a gym, and school with further shopping facilities available at Heathfield. Heathfield hosts a variety of supermarkets as well as a range of small boutique shops, cafe's & food outlets. There are a wide variety of reputable schools in the area for all ages and mainline rail links available at Buxted & Stonegate, both providing a regular service to London. Nearby sporting activities available including, golf, rugby, tennis, cricket and fishing.